Why would anyone want a HTPC? There are lots of reasons ... and and lots of web sites talking about them ... and lots of different operating systems (who knew?). So ... I'm building one. I don't have $1k lying around so I am buying the parts peace meal, as I can afford them and as they go on special. To date, I have purchased the Silverstone Milo 07 computer case. A quick glance at the above build spec could leave you scratching your head ... where are you planning to put all of the hours of TV that you will record? Are you going to rip your DVD / Blue-Ray collection to an electronic medium? Where is the Graphic Processing Unit (GPU)? Not to mention the TV tuner ... don't you need a tuning card to get access to the TV stations? The previous pages discussed me networking my house. The HTPC needs to be considered in the context of an Ethernet home network. It will be one node attached to a TV screen but with access to the rest of the network ... and via the network, the internet. The storage issue will be handled by a Network Attached Storage (NAS) PC. This is another PC that I am planning to build during the year. The catch is that, with Windows Media Center (WMC), you cannot record to a network storage location. Ok, ok ... the is a work around with this .. but I am initially going to keep it simple. So ... I need a Hard Disk Drive (HDD) in the HTPC for accepting the initial recording(s). From there, it will be automatically shunted to the NAS using various custom methods (batch file, program to remove ads, sync options, etc). I could use a 3.5" HDD ... but in the case that I am looking at, the single location for putting any drive this big isn't ideal and will take up too much room ... room that I am looking to use for a) airflow and / or b) cable management. I could use a solid state drive (SSD) but recording and moving will mean lots of reads and writes. Not something that you really want to do with a SSD. That left me with a laptop HDD that is the same size as an SSD (2.5"). This case has 3 locations for a drive this size and two of them are very convenient. 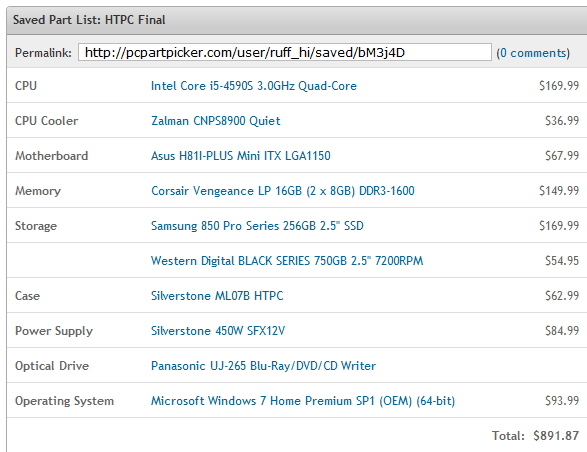 As you can see from the above build list, a 750Gb WD Black is about $55 ... that is really cheap. Nope - not using one. I'll use on-board graphics processing via the mobo / central processing unit (CPU). My current PC has a Ceton InfiniTV 6 PCle tuner but these can get a little hot, especially when multiple tuners are being used. I don't want a HTPC that requires lots of cooling. More cooling required, more fan noise ... yuk!. So ... home network to the rescue again ... I will be putting the TV tuner on the network in a totally different part of the house via a Ceton InfiniTV 6 external tuner.